Disc brakes are superior in many ways to drums. This is why disc brakes are installed on the front of most passenger cars and are recognized as a better solution for the rears as well. On FWD the front brakes provide over 70% of a vehicle's stopping power. There are a few different types of brake calipers manufacturer's install on automobiles and light trucks today. A fixed caliper uses two or more pistons to provide clamping force on both sides of the rotor at the same time. A floating caliper uses a single piston and the caliper body or mount to provide clamping force to the pads and rotor. These calipers slide on a set of lubricated pins or rails. A floating caliper typically uses one piston and the caliper housing to clamp down on the rotor. The piston moves the inboard pad into contact the inner side of the rotor. The force of the inboard pad contacting the inside surface of the rotor causes the caliper to slide or float on the pins mounted to the bracket or steering knuckle. This forces the outboard pad mounted inside the caliper housing to contact the outer side of the rotor. This clamping force on the spinning rotor is what causes the wheel to slow and stop. As mentioned these pins can stick in their bores preventing sufficient braking force and causing the inboard pad to wear prematurely. A fixed caliper has pistons on both sides of the rotor. These pistons squeeze both the inboard and outboard pads with equal force causing the vehicle to stop. This type of brake caliper is often found on light and medium trucks. Brake caliper pistons are made of either chrome plated steel or phenolic plastic. Both of these are hollow to save weight. The phenolic pistons are great heat insulators and thus help prevent heat from degrading or boiling the brake fluid. 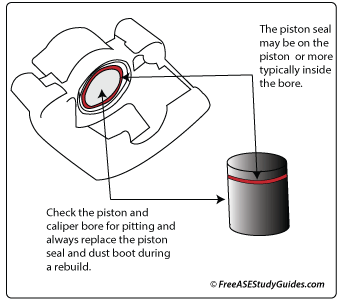 A square cut piston seal is used to contain fluid pressure and to return the piston to its released position. The seal distorts and bends as the brakes are applied. 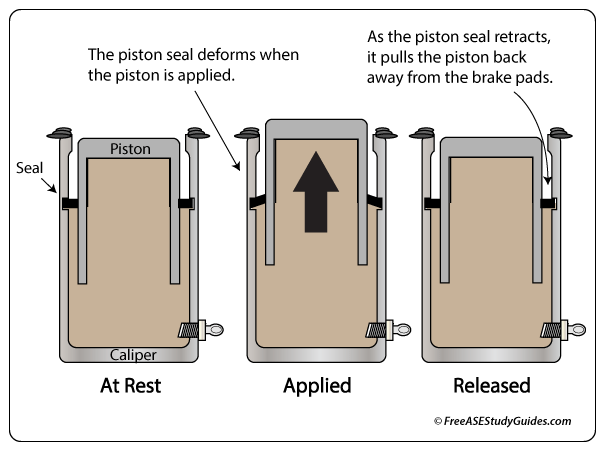 When the pressure is released, the seal returns to its original position pulling the piston back into its bore with it. This allows the pads to release a short distance away from the rotor surface. Leaving the pads just thousandths of an inch from the rotating rotor keeps them clean from debris and still allows trapped dust and gases to escape. Trapped dust and gas cause gas fade resulting in a hard brake pedal and increased pedal effort.